Pollinators are suffering from loss of habitat, chemical misuse, the proliferation of invasive plants, disease and parasites. In the U.S. Nearly 44% of colonies were reported lost to Colony Collapse in 2015-16. During the winter of 2017-2018, beekeepers in the state of Wisconsin reported losses of 73% of honey bee colonies. Pollinators are responsible for the continuation and reproduction of countless plant species around the world, as well as the key to successful food production. They are responsible for more than one-third of our food supply and 75% of the world’s agricultural crops. 1. Plant Natives! 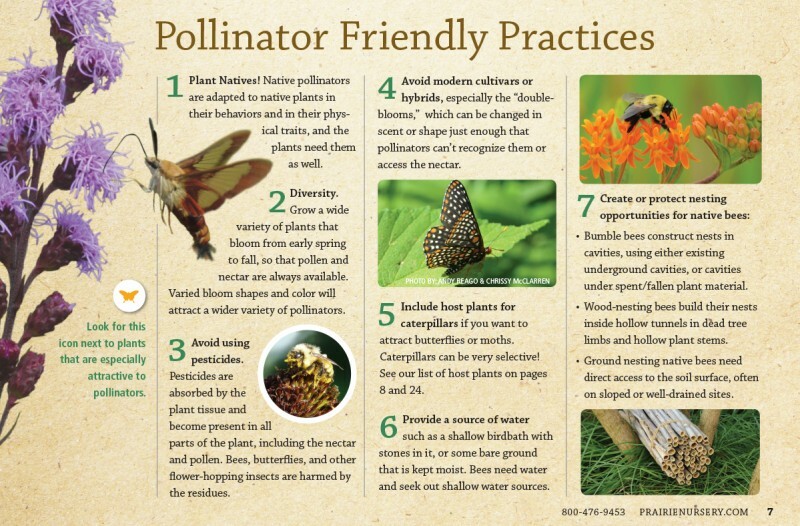 Native pollinators are adapted to native plants in both their behaviors and in their physical traits, and the plants need them as well. 2. Seasonal Diversity. Grow a variety of plants that will bloom across the season – early spring thru fall – so that pollen and nectar are always available. Varied bloom shapes and color will attract a wider variety of pollinators. 3. Avoid using pesticides. Pesticides may be absorbed by the plant tissue and become present in all parts of the plant, including the nectar and pollen. Bees, butterflies, and other flower-hopping insects are harmed by the residues. 4. Avoid modern cultivars or hybrids, especially the “double-blooms” which can be changed in scent or shape just enough that pollinators can’t recognize them or access the nectar. Studies show that altered foliage color is also a deterrent. 5. Include host plants to attract more butterflies and moths. Many lepidoptera are very selective when it comes to where they lay their eggs. 6. Provide a source of water such as a shallow birdbath with stones in it, or some bare ground that is kept moist. Bees and butterflies need water, and they seek shallow water sources. • Bumble bees construct nests in cavities, using either existing underground cavities, or cavities under spent or fallen plant material. • Wood-nesting bees build their nests inside hollow tunnels in dead tree limbs and hollow plant stems. • Ground nesting native bees need access to the soil surface, often on sloped or well-drained sites.